As a marketer, you should never tune out new ways to generate business leads. The moment you become complacent about your advertising is the moment your business starts dying. While the advertising landscape is fluid thanks to rapidly evolving technologies and mediums, one popular form of advertising that's unlikely to fundamentally change any time soon is email marketing. For the last several years, email marketing has been one of the most tried-and-true methods for cultivating new relationships with customers and strengthening existing ones. The flexibility of emails allows for a broad range of benefits to both consumer and business, including the timely dissemination of deals, news and other information, as well as the ability to track open rates and other vital metrics. Even if your business is not currently engaging in email marketing, you should still be collecting email addresses to ensure that you have a built-in audience if and when you're ready to get started. 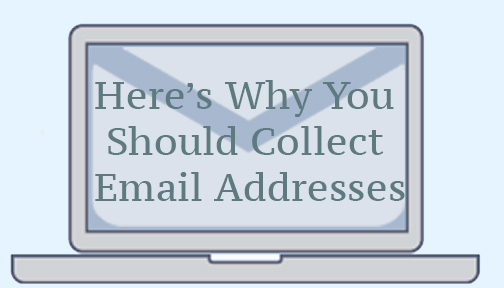 Fortunately, there are a number of non-invasive ways to collect email addresses. Follow these strategies and soon you'll have a robust list of customers that voluntarily offered their information and want to hear from your business. Note: It's always a good idea to check with your legal team before deploying any email marketing strategy to ensure it complies with privacy laws. 1) Winner winner: Create an online contest, such as a sweepstakes or giveaway, and encourage customers to sign up with their email address. Make sure your point of sale staff mention the contest to customers at checkout so they can sign up right at the store. Promote the contest with in-store signage, as well as on social media. 2) Website CTA: Embed an email sign-up form on the home page of your website, where it is easy to find. This will likely entice at least some customers to volunteer their information. If you're not currently engaging in email marketing, don't over-promise about what the content will include. The form alone will suffice for now. 3) Digital cross-promotion: If you or your employees use email for "cold calling" or other business purposes, add a link to your email signature that takes customers to a landing page where they can subscribe to your company's email list. Also, be sure to include a sign-up link on your social media pages. 4) Bowl 'em over: If your business lends itself to such a competition, prop up the old "free lunch bowl" at your store and allow customers to drop in their business cards. The prize, of course, doesn't have to be free lunch. It can be a free oil change, pair of socks, guitar lesson or something totally different. What's important is that it serves as a catalyst for bolstering your email database. 5) Partner up: Work out a deal with a partner company wherein they provide a sign-up link to your email list on one of their newsletters. It's an easy way to increase your brand awareness, generate new leads, and foster your relationship with new customers through relevant, well-timed emails. For more information about running a successful email marketing campaign, contact the email marketing team at Rebuild Nation online or by calling 855-725-3628.